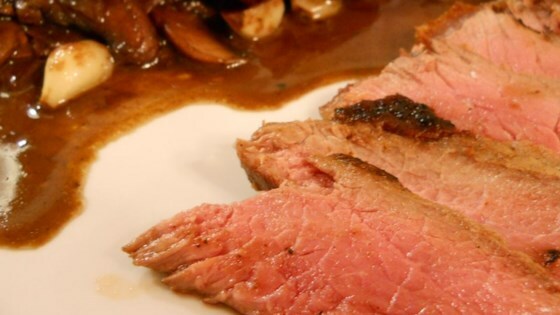 "Pan seared flat iron steaks are served with mushrooms and shallots in a balsamic red wine sauce. I like these steaks because they are tender, but not so lean that they get tough if you over cook them." Heat the oil in a large skillet over medium heat. Cut the flat iron steak into individual portions if needed. Season with salt and pepper on both sides. Fry the steaks until browned on each side, 2 to 3 minutes per side. Remove from the skillet and place in an oven proof dish. Set steaks in the oven to continue cooking. Add shallots and whole cloves of garlic to the hot skillet. Cook and stir over medium heat until shallots are starting to brown. Add mushrooms to the pan; cook and stir until they shrink some, 5 to 10 minutes. Pour the balsamic vinegar into the pan with the mushrooms and stir to remove any bits that are stuck to the bottom of the skillet. Pour in the red wine and simmer for a few minutes over medium heat. Return the steaks to the skillet and cook until the internal temperature reaches 135 degrees to 140 degrees F (60 degrees C), about 5 minutes if at all. Remove the whole pan from the heat and let stand until steaks reach an internal temperature of 145 degrees F (63 degrees C), or your desired degree of doneness. I slivered the garlic which gave it more flavor. This could be a little more saucy. Next time I'll add some broth or stock and finish it with butter. quite tasty! just use a couple of shakes of balsamic and a full cup of wine for a yummy taste. Super! Cooked as directed, except I didn't have any shallots. If you like medium rare or rare, limit oven time! YUM!!!! While the steaks were keeping warm in the oven, I topped the steaks with goat cheese. I also served this with spaetzle...it soaks up the sauce. Thanks for sharing! My family LOVED this one! I used only half of the recommended bit of balsamic vinegar. Fabulous!